The good news is that this was another fine episode. The bad news is that it was centered on the two characters I like the least. The zombie apocalypse plus the death of his mother has broken Chris Manawa into little homicidal pieces. In the pilot episode, he was a rebellious but principled kid who was passionate about social injustice. Now he is a savage, unfeeling wolf who actually believes that killing a friend with an injured paw (to extend the metaphor) is the right thing to do. Chris seems to be experiencing that high school phase where the approval of his peers is vastly more important than the approval of his parents. But this isn't high school, and his new friends are killing people. Brandon and Derek are caricatures of selfishness. They want to be driving along and tearing up the landscape with their tunes playing as they experience the ultimate in freedom from the strictures of society, and Baby James getting shot by the farmer put such a huge cramp in their plans that they couldn't even leave him behind to live or die on his own. They had known James since he was four years old, and they still killed him. The unfortunate James was lying about the amount of pain he was in because he knew it was coming, realized that they were seeing him as dead weight. Like their other buddy Troy, who got bitten. It really bothered me that the boys simply ate all of the chickens until they were gone, instead of eating the eggs as Travis kept suggesting. They had stumbled upon an isolated farm with a sustainable supply of food and water, priceless during a societal breakdown, and they threw it away like so much garbage. So stupid, when anyone with a brain could guess how bad it's going to get out there. 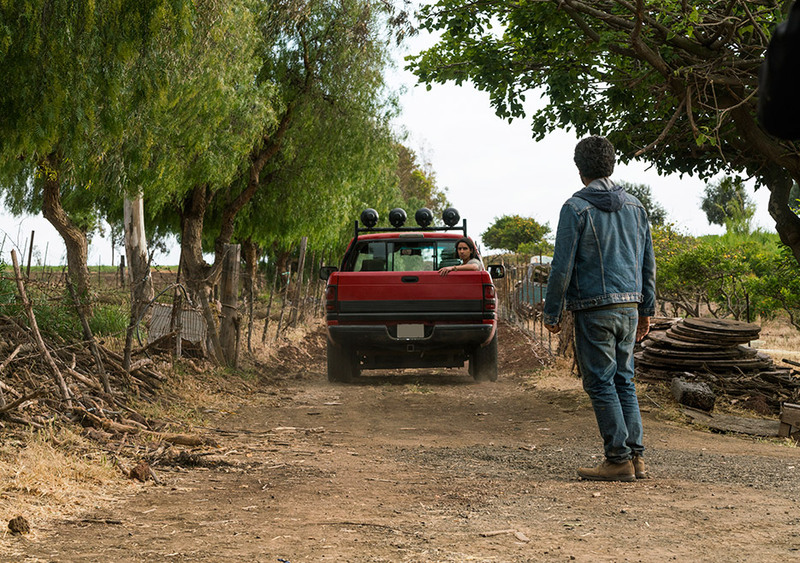 Chris kept telling Travis that he knew the right way to act during an apocalypse and Travis was wrong, but it's possible that deep down, Chris realized the truth and was ashamed of his behavior. He had to look away when they drove off in the truck and left Travis behind. If Chris had sided with Travis, would Baby James have lived? How would Chris have felt if Travis' feet hadn't healed so quickly, and the boys had decided to kill Travis instead? I'd like to think that Chris would have objected, but I honestly don't know. It's funny (interesting, not funny ha-ha) how his conflict with the spring break gang made me like Travis for the first time. Until now, his stubborn refusal to realize that things had changed was frustrating, but this time I had to admire him for trying so hard to hang on to civilization and do the right thing, setting a principled example for Chris in the only way he knew how. Pleading for James' life. Sleeping next to James in the barn with a gun in his hand to protect him from, of all people, his own son. Burying the farmer next to his children. Even going to the trouble of finding out the farmer's name and date of birth so that he could carve an inscription (reminding me of Morgan and Eastman in "Here's Not Here"). And now Chris has taken off with these boys who wouldn't wait a couple of weeks for Baby James' leg to heal, who wouldn't even leave James behind with Travis so that he had a chance to survive. I'm sure Travis was thinking about what these heartless boys would do if something happened to their new best bud Chris. Which might actually be the scenario, since Brandon and Derek just showed up at the hotel gate without Chris. So Madison didn't get Nick back (yet), but she did acquire a couple of dozen unwanted and hungry guests who are now hanging out in the hotel garage. And of course, she got her honey back. Or did she? She and Travis had that slomo across-a-crowded-room moment at the hotel gate, but later, he was pushing her away -- even after telling her that God might have reunited them. Travis wondered if he should have allowed Brandon and Derek to kill Baby James so that he could stay with Chris, like he could have thrown away his own core principles that easily. How far should a parent go to protect a child, even under circumstances like these? Especially when that child has become a monster? At least Travis could finally relate to how Madison felt when Chris threatened Alicia's life back in Baja. But Travis also didn't seem to connect losing his son with the fact that Madison has also lost hers. I thought afterward about Nick versus Chris. Nick is clearly better equipped emotionally to survive, mostly because he already saw the world as a horror. Yes, he nearly died at first, but Nick landed on his feet at the colonia and he's using his skills as a junkie to help his new community make it. And happily, Madison is again working on her relationship with Alicia. Did she have to tell her about her father's suicide note, though? Was it just Madison's way of explaining her favoritism toward Nick? A better way to look at it was that Madison decided to treat Alicia like an adult by telling her the truth, I suppose. "I love you all, but enough is enough." Gee, I bet Daddy Clark wouldn't have lasted five minutes in the apocalypse. Come to think of it, that sounded a lot like a suicide note Nick could have written, doesn't it? As self-destructive as he was, I don't think Nick is suicidal. At least not any more. -- Cliff Curtis' American accent slipped in this episode. I think it was the first time. -- The shot of the farmer's face as he was buried was oddly effective. 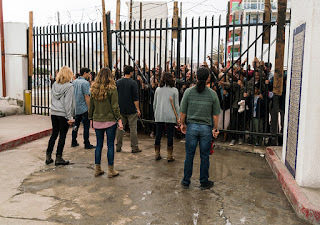 It also reminded me that FtWD doesn't hit us in the face with zombie gore as much as the parent show does, and I appreciate that. 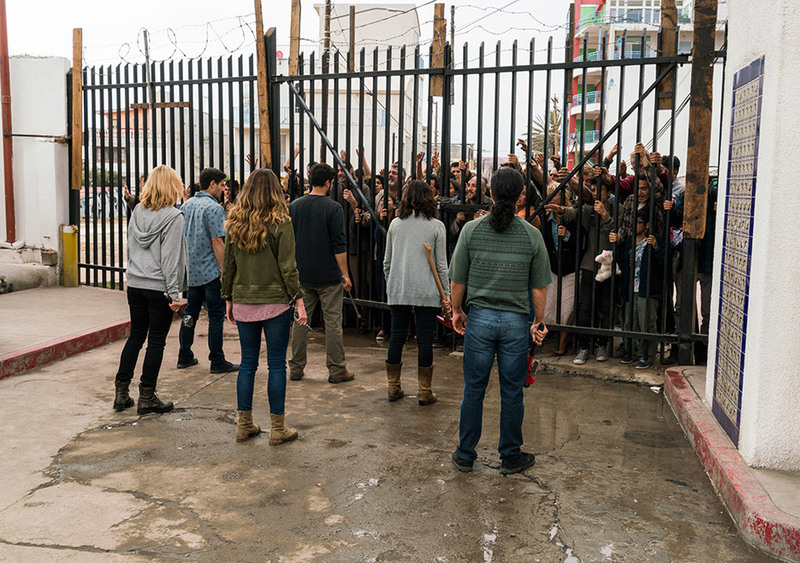 -- The refugees clawing at the chained hotel gate looked like walkers. I'm sure that was intentional. -- The farmer and Chris had the same birthday. An anvil of foreshadowing. And Travis realized that he didn't know what day it was anymore. -- Lorenzo James Henrie (Chris) was a guest on Talking Dead after this episode. He completely gets why the fans don't like his character, and he admitted that he feels the same way. -- Next week is the season finale. They're airing the last two episodes together. Hector: (re: Madison and the refugees) "Her mistake." Chris: "There is no more good. There is no more bad, right or wrong. It's us or them, kill or be killed. And James, he's one of us." Except when he becomes a liability. Travis: (to Baby James) "Your buddies. They want to put you down." Like a dog. Or maybe a chicken. The "sort of" in that equation is that I also think it's not unreasonable for this to happen. I can see the logical progression. It also led me to thinking, for a moment, that Travis would just - without hesitation - decide to end his life by stepping off the balcony. Even more so when Madison talked about her first husband. Dunno. Maybe this is foreshadowing of what'll happen to Travis. In any case, I'm really enjoying the separate storylines here. I think they're very well written, directed and acted.